How to Bake Chicken Breasts | Easy Chicken Recipe + Dinner Idea! Tender and juicy, perfectly baked chicken breasts! One of my favorite chicken recipes and the ONLY method you will need for making baked chicken. You heard that right: The one and ONLY method you will need for baked chicken. 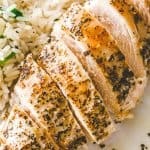 I have used this recipe for perfectly baked chicken time and time again, all with different seasonings and flavors, and it has YET to disappoint. It’s so tender and so juicy that you will most likely come on over here and thank me for sharing this little secret of a method. Maybe? By the way, HI, friends! Are you feeeeeling it? The little bit of January-nano-second-extra-daylight? Sun goes down at 4:18 p.m. now instead of 4:17.6 p.m.! High-Fives, everybody! Spring is NEAR! Nah, I know we have a couple months left of this dreary sleepy weather, but the one thing that I DO like about winter is all the cooking I can do. I am way too cold to go out there so I just sit in my kitchen and draft up recipes. Then, I test them, then we eat them, then I make them again, photograph them, AND finally I get to share them with you in my little space here. 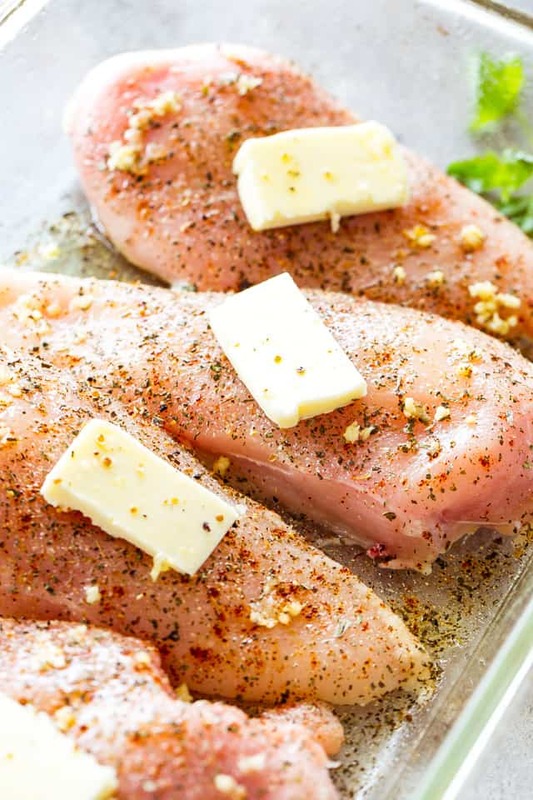 Today I am going to show you how to make the most perfect baked chicken breasts. All it involves is; butter, parchment paper, seasonings, fork, and a knife. Fork and knife not needed until you’s are ready to eat ’em up. The secret is in that parchment paper placed over the chicken breasts. Parchment paper prevents the chicken from drying out. In this way, the chicken bastes in its own juices and we end up with perfectly tender, juicy chicken breasts. But this time, instead of wrapping it all up inside foils, we’re just going to cover the chicken with parchment paper. This makes the chicken sweat while it bakes and the result is a juicier, tender chicken breast. 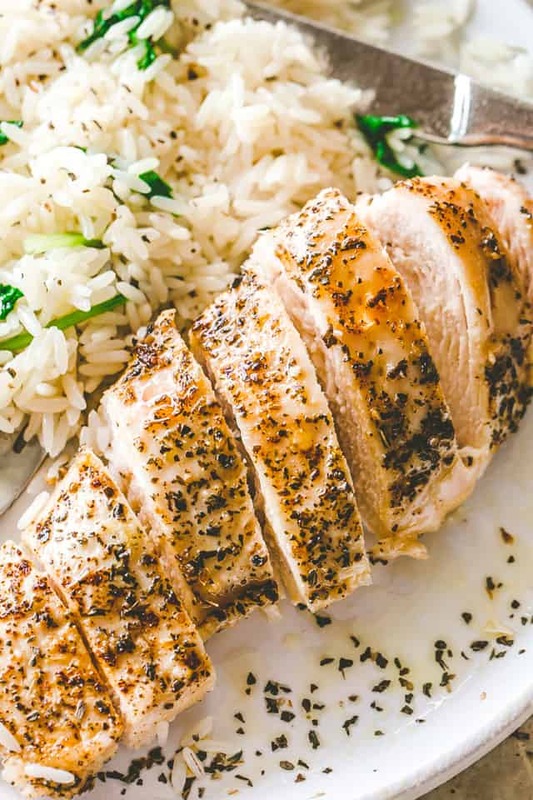 You can use this method and recipe pretty much any time that you need to bake up some chicken breasts. It’s a tried and true method, taught in culinary schools, and it works each time with whatever seasonings you wish to use. I’m pretty sure garlic is part of my DNA… or something like that. Let the cooked chicken breasts cool completely. 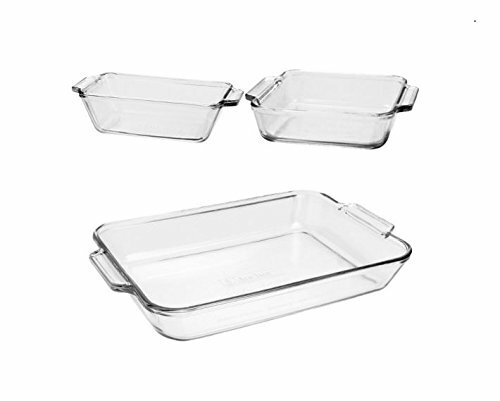 Refrigerate cooked chicken breasts in an airtight container, or wrap tightly with plastic wrap. 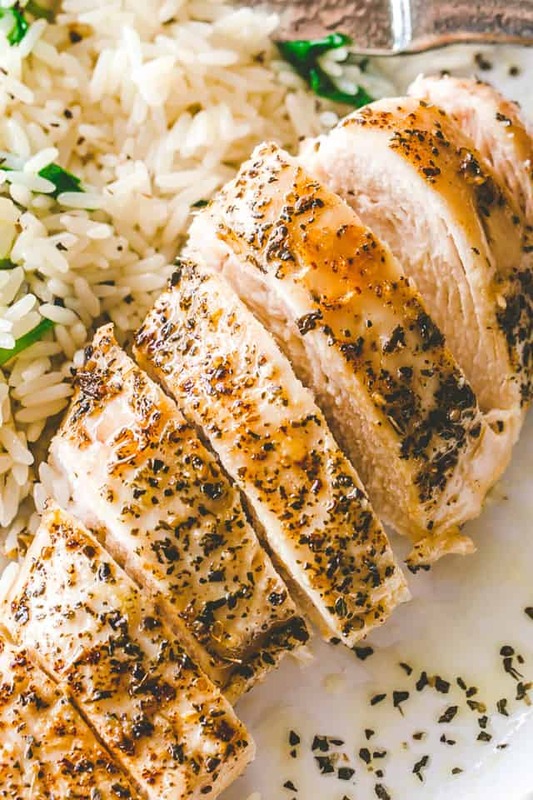 Cooked chicken breasts will last for up to 4 days in the refrigerator. Wrap cooked chicken breasts tightly in plastic wrap and add a layer of aluminum foil over the plastic wrap. Place the wrapped chicken breasts in a freezer bag; seal the bag, pushing down on the bag to press out as much air as possible. Place the bag in the freezer toward the back where it is the coldest. When ready to use, remove from freezer and set in the fridge overnight to thaw out. Tender and juicy, perfectly baked chicken breasts! The one and ONLY method and recipe you will need for baked chicken. Thanks for the recipe! But, I wish more internet articles would put step by step part of the recipe at the top of the page instead of making me scroll through 10 feet of advertisements and explanations. Delicious, Delicious, Delicious!! Super easy recipe and I don’t mind the ads when you know it leads you to nothing but yumminess! Definitely my go to baked chicken recipe! Newbie to cooking – I have frozen chicken breasts. Will this still work? I wonder if I could sear these first in a pan to make them brown and pretty and then bake them under parchment? I’m a visual person. Thoughts? I usually cook chicken breasts for my breakfast. It’s just baked with a boring way but you gave me a new way to cook it.I’ll try it. Thanks! How about putting a little melting parmesan on the cover? By the way, I want to thank you for your great recipe! Deelicious! Thanks for the recipe. Love this recipe as it was pretty simple and straightforward. We just got done with dinner and I got some more going in the toaster oven for during the week. I did have to cook a little longer, however the taste was phenom and the tenderness on point! Great go to recipe. Thnaks for your sharing! Good recipe, but seriously overcooked! I used a Le Creuset with organic chicken breast and would try 375 degrees at 25 min. Maybe the breasts I used were smaller or the pan conducted the heat more? We marveled at how “moist” the “dry” chicken was… Edible, but it would have delicious if it wasn’t so overcooked… Will try again!!! The chicken breasts will still need 30+ minutes to cook. If they are smaller breasts, I’d start checking at the 25-minute mark; chicken breasts are done at 165F internal temperature. Wow do you think you can add more ads on this one page? do you think it’s possible to make it harder to access the recipe??? c’mon, sell out just a little bit more, i think you haven’t done enough yet! I hope this chicken tastes like Jesus himself came down and shat in my mouth, given how many ads attacked my eyes trying to make it. spend money for her cookbook; she is posting it online. Do you think she does that out of the goodness of her heart? She does this to make a living. Or did you just have a bad day and need to piss and moan and curse at someone? To see the recipe itself, you can use free “capture selection” software. Easy! This is the most delicious, juiciest chicken I have ever tasted. Definitely saving this one to make again! I usually completely change the recipes I find. This time, the only thing I changed was adding balsamic vinegar when coating the chicken. I must say the chicken was AMAZING! So juicy! Perfect timing, perfect seasoning, and juicy! I’m so happy! She said 400 degrees in the recipe. Do I need to beat/tenderize the chicken breast using a meat mallet or that is not required? This was ok but I didn’t think it was near delicious. It had a grayish color and was unappetizing to look at. YUM!!! SUPER MOIST AND JUICY. This is my first time baking chicken EVER, and this turned out super delicious juicy and moist. Thank you for this beautiful simple recipe. I do agree with you that the parchment paper is such a secret to keep the juiciness of the chicken breasts. Sometimes with other food like vegetables or pork, chicken, etc I don’t use the paper and it turned out overburned a little bit and dried. Anyways, Baked chicken breasts are yummy! 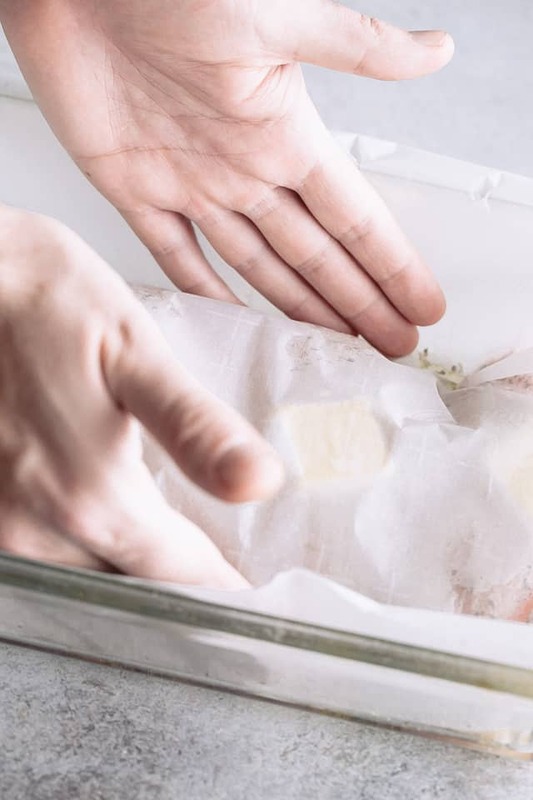 Can i use aluminum foil over parchment paper? This recipe is absolutely fantastic!!! First of all, I don’t like to cook because it never comes out right. i’ve tried different website recipes and it seems cook-times are all over the map for the same dish. One site had a cook time of 18mins-Really? Geez, no wonder it was pink inside and tough to chew. I threw it away. Anyway, the first time I made this a few days it ago, I expected another disappointing failure–but NO!! The breast was fully cooked at instant-read temp 0f 165f, the meat was very tender and juicy and actually tasted like chicken and that someone else made it–not ME! Now just to be sure, I pre-seasoned another breast the same way and left it the refrigerator overnight. The next day I cooked it exactly the same way as before and lo-and-behold it came out perfect again!! This is a WINNER! I’ve already bought more breasts in anticipation of another successful meal! I’ll quickly burn myself out on this I’m sure, so I hope you have other recipes as I will certainly try them. Thank you!!!! Anyways! Now that I got through all the ads and can finally see the details…….. this looks good . . But had to wait till I could let the web page to load to finish the recipie. So I’ll let you know how it tastes . Seems like it will come out good. !but pleaSe let people see the recipie so they can make it instead of being redirected from web sites . Makes it hard to coook it if they can’t see what was posted ! I agree! This recipe was delicious and easy….but the web page was difficult! Delicious! I didn’t have fresh garlic so I used powder (I know…. ), and omitted the butter subbing veg stock. They were the most amazing, moist chicken breasts I’ve had ever! I will try it with the fresh garlic and butter next time. Thanks for the recipe. This looks delicious. I’m gonna try then give a review. I used all different seasonings that I had plus yours. Thanks for this great recipe. Excellent easy to do recipe with outstanding flavor.i like using a clay baking dish and it did well. I cannot find the recipe for the easy baked chicken breast in the One Pot. I am not sure how long to cook it for. You have to scroll down, past all the pics, to get to the recipe box. All the information is there. Odd question but new to cooking. Do I need to turn the chicken halfway through baking? Hey could you add lemons to this recipe? I realize this sounds like a dumb question, but I dont’ understand the tucking the parchment paper under the chicken thing. My butter sticks to the paper when I try to tuck the parchment under the chicken. Is it supposed to be tucked in tightly all round? Just lengthwise? I appreciate the hard work that goes into making a recipe and posting it on your blog and not trying to nitpick, but another photo of what it looks like all tucked in would be helpful. Thanks! I’m glad you asked this because I didn’t see the question that the first commenter had posted. I’m VERY sorry about that! Wax paper will burn or melt. 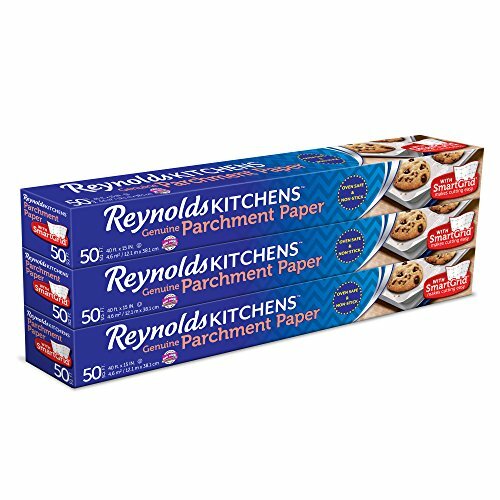 It’s best to use parchment paper because it is heat resistant. Can you leave out the pat of butter? I’m marinating with a Greek Chicken Marinade. Will the chicken still be juicy and tender if I do not add a pat of butter to each? Hi! I assume the marinade is saucy, so you can definitely get away with not using the pat of butter. 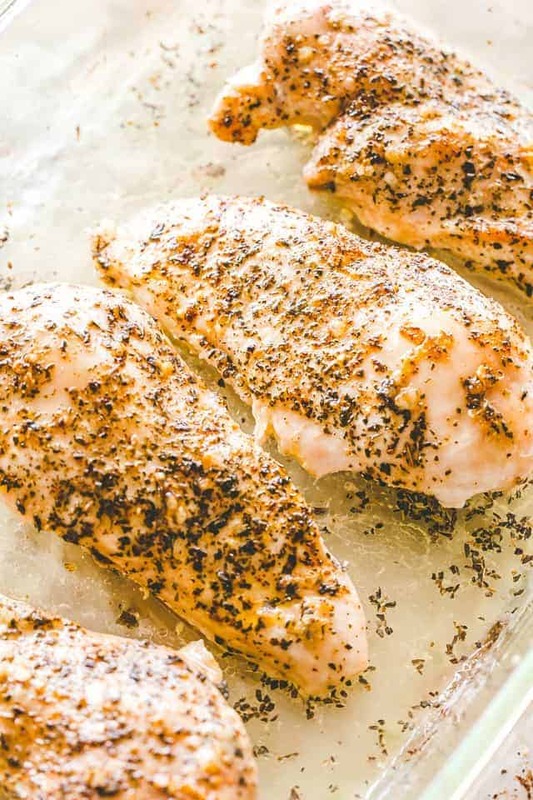 This recipe is used more for the plain baked chicken seasoned with salt, pepper, and herbs. This sounds super easy! Going to try tonight!! Thanks for sharing such a great recipe. Wondering if you’ve ever stuffed the breasts with goat cheese & sun dried tomatoes? 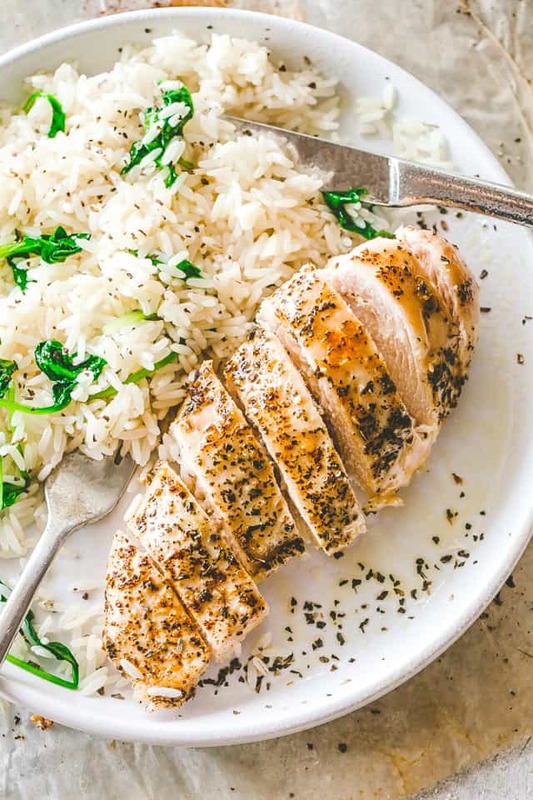 I’m just about to make this but wasn’t sure if the recipe is calling for 4 chicken breasts totaling 1 pound or each chicken breast is 1 pound for a total of 4 pounds? Please help. Thank you! Cam i make this without the italian seasoning? I dont have parchment paper or garlic. Can I use just garlic salt and foil?? I’ve made this multiple times since I found this recipe…..my family LOVES it! Absolutely delicious, juicy and easy! Waaaay better and faster than cooking on a grill. Thank you for a perfect recipe! I’m making this tonight – in reading the recipe I think that perhaps step 4 should come before step 3. Any comments? Anna - Budget. Earn. Live. I love this recipe! It is so easy and my family loves it. I do switch 3 and 4 in a way. I will season the bottom of the breast and then place in the dish then I will rub on the garlic and season the top. I just made a meal off of this chicken and your shopska salad. It was delicious and healthy! I love how easy this looks to make! I’ve never cooked chicken this way, but it sure does sound good (and easy)! Glad to have this technique on hand! OMG! This is exacly what I need right now! I can’t believe how easy this is. This is to easy to not make. Perfect to pair with fresh veggies. This is so genius! I’m making this tonight!! Moist and tasty. Such a versatile cut. 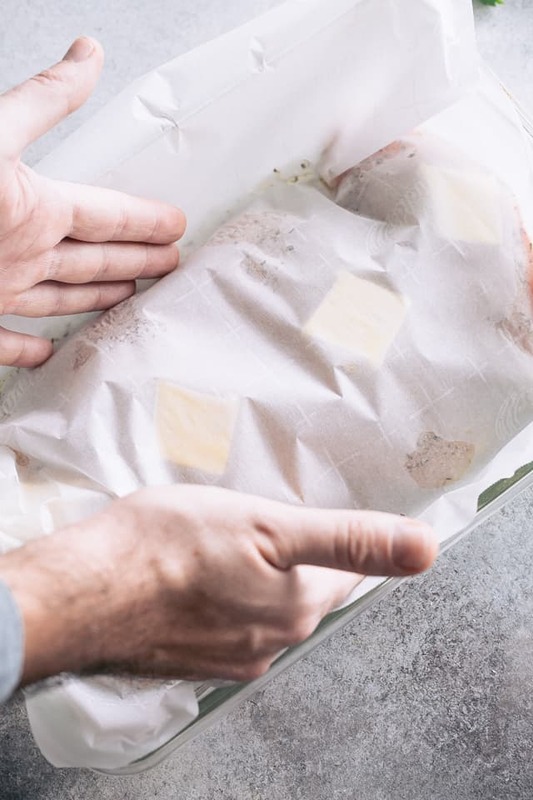 Do you cover each chicken breast individually with parchment paper? No, just one big piece of parchment paper over all the chicken breasts. Cover them with that one piece and tuck it underneath the chicken. Can you use foil instead? Have no parchment paper!